Stew is a combination of solid food ingredients that are cooked in liquid and served as gravy. Ingredients in a stew can include vegetables, meat, seafood and sausages. The cooking liquid generally used is wine/beer or vegetable/meat stock in western countries. Instead of that we use coconut milk in Indian cuisine. 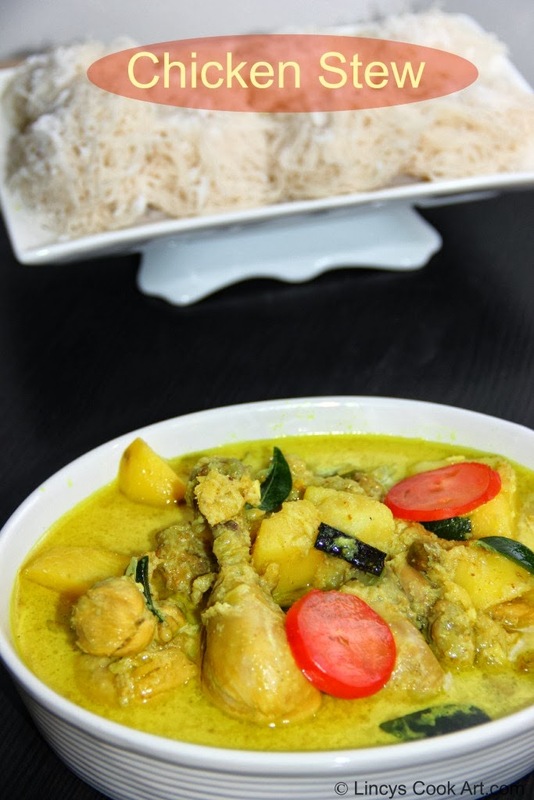 This recipe belongs to the Kerala cuisine. Stew would be more flavorful if you use chicken with bone in. Using tomato in this stew is purely optional but if you intend to use tomato use only half a tomato, the sour taste of the tomatoes will not go well with stew. I have used only potatoes in this recipe. You can add carrots, beans and peas also in this stew together with chicken. You can have this stew with appam, idiyappam, puttu, chapathis and pathiri. In a pressure cooker pour the oil then add the cinnamon, cardamom pods and cloves. Then add the onions and cook till it becomes semi soft. Then add the ginger and garlic and cook for 2 minutes. Then add green chillies and cook for a minute. Add the chicken pieces and salt (without adding water) cook till the chicken browned lightly. Now add big potato chunks, 1 and half cups of water, turmeric and salt. Keep the lid on and cook the chicken on medium flame wait for a whistle and put off the gas. When the steam escaped from cooker add the corn flour when the curry thickens and the coconut milk, pepper and curry leaves. Bring it to boil and put off the gas. Don’t overcook after adding coconut milk. If you overcook the coconut milk tends to split. Looks very yummy and tempting clicks too. I agree that chicken with bones add extra flavors. In fact I prefer the bones than the meat itself. Nice creamy chicken stew. Shall try out soon. Mouthwatering clicks! Love the flavor of coconut milk with chicken and potatoes. Hi dear, I am nominating you for liebstar award, please collect at my space.